Measured as the working time leading to a luminous flux drop to 80% of the initial value. 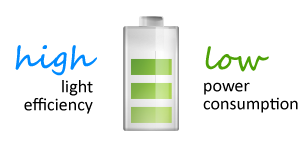 The LEDs used by Electromax have this value of 50.000 hours, lab tested by the manufacturers. 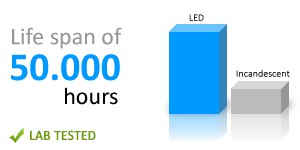 Net superior ratio to other light sources between the luminous flux and the electrical consumption. That is because of the specialized optical system and the efficiency of the power supplies that are used. Available in a range of colors that can be combined to obtain the desired color palette without the use of additional filters. With controllable light effects, they are suitable for adjusting the luminous flux and chromatic scenarios. LEDs preserve energy and do not contain mercury nor any other toxic substances that can pose a great risk like in the case of fluorescent or incandescent bulbs. 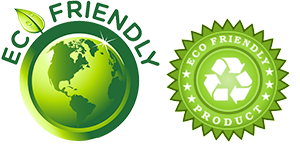 Furthermore, they are entirely recyclable and actively contribute to reducing carbon dioxide emissions in the atmosphere. 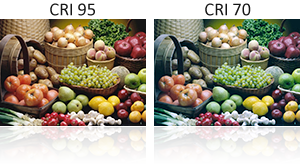 The color rendering index (CRI), is a quantitative measure of the ability of a light source to accurately reproduce the colors of various objects, as compared to an ideal or natural light source. 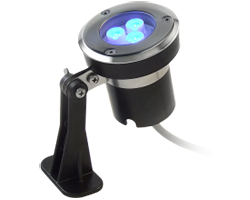 Light sources with a high CRI are desirable in color-critical applications such as photography and filming. UV and IR radiation-free, the light does not heat the illuminated surface. 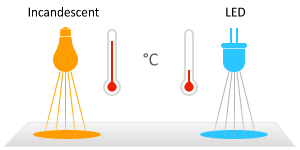 UV radiations are known to damage eyesight and fabric materials, whereas IR radiations can cause burns. Using specialized and dedicated lenses to optimize the efficienty by reducing leakings caused by reflections and adjusting the type and level of light distribution. The light is instantly on and with no flickering, because of the absence of a gas environment and its ignition time, as in the case of fluorescent bulbs. With almost no maintenance at all, LED based lighting fixtures are suitable for use in difficult access areas. The reduced size and weight, make it possible to merge innovative solutions with compact design. The light source represents a device that basically handles the conversion of electrical energy to light energy. Based on their type of light radiation, light sources are classified as either sources that emit light radiation by thermal means and sources that emit light radiation by molecular agitation. The luminaire, or the lighting fixture, is defined as the apparatus which distributes, filters or transforms the light transmitted from a lamp and which includes all the parts necessary for supporting, fixing and protecting the lamp, but does not include the actual light source. The luminous flux represents the radiant flux emitted in the visible spectrum, evaluated as the intensity of the visual sensation. The measurement unit is the lumen (lm). The luminous flux is a property of light sources. The luminous intensity, in a given direction, represents the ratio of the base luminous flux emitted within an infinitely narrow solid angle, through that angle. The measurement unit is the candela (cd). 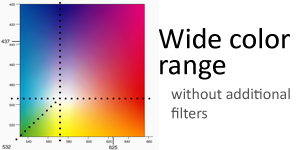 The distribution of luminous intensity is a property of luminaires. 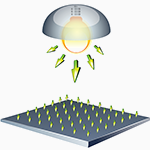 The illuminance is a property of the luminous flux reception and represents the ratio of the flux to the base surface. The measurement unit is the lux (lx). The illuminance is a standardized quantity, there are norms and recommendations regarding the value of the illumination on the work plane, depending on the nature of the activity. 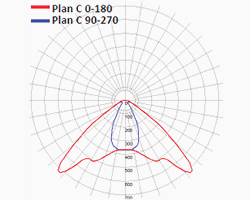 The luminous intensity distribution curve represents the repartition of the luminous intensity in a plane that passes through the axis of the luminaire. If the repartition of the luminous intensity is symmetrical, a single luminous intensity distribution curve is enough to characterize it. For an asymmetrical repartition of the luminous intensity, several distribution curves are neccesary and their exact number is based on the degree of asymmetry. The luminous intensity distribution curves are reduced to a conventional lamp with the flux of 1000lm, so that they can be applied for different fluxes of varying count or power. 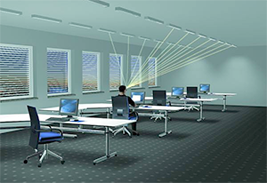 UGR stands for Unified Glare Rating and represents the index used to evaluate the discomfort glare produced by a lighting system. UGR depends on the luminance in the visual field, on the room dimensions, the reflectances and the observer's posisiotn. The UGR value domain ranges from 10 up to 30. The European standard for indoor lighting (EN 12494) offers recommandations for both the illuminance level and the discomfort glare limit, for various activities. A higher value indicates significant discomfort glare, while a lower value indicates low probability of discomfort glare.